Mark Hamill admitted early on, before the release of The Last Jedi, that he did not agree with the way Rian Johnson wrote the Luke Skywalker story arc in the movie. The actor later admitted that he regretted making that statement, but he seems to be slowly coming back around to his original thoughts. Luke is the main hero of the original Star Wars trilogy and the man who brought Darth Vader back to the Light Side of the Force, so many fans of the franchise were stunned to see an old jaded Skywalker who exiled himself away from friends and family who needed his help. A Star Wars fan messaged Mark Hamill on social media to ask why Luke Skywalker gave up in The Last Jedi. 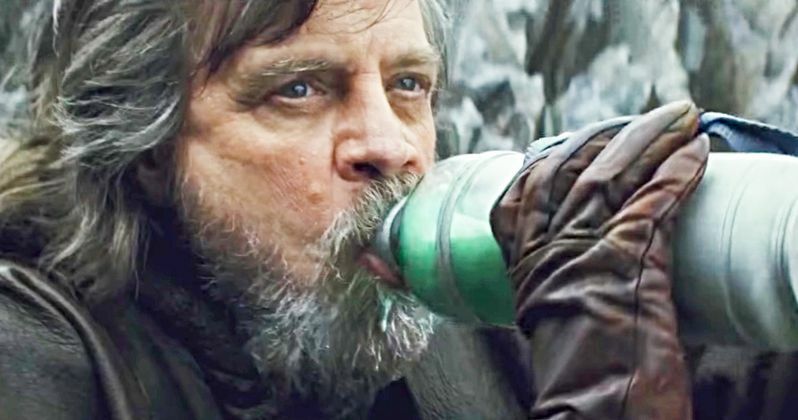 The fan believes that we only saw Luke make one mistake, which led to his self-imposed exile on Ahch-To, noting that it doesn't make sense to him. Hamill, who is always great with Star Wars fans on social media, responded to the question. He said, "When I Understand, I'll let you know." Mark Hamill definitely delivered an honest answer about Luke Skywalker in The Last Jedi. The actor still doesn't get why Johnson wrote the character like he did, which has led to speculation that a new novelization could go on to show other reasons why Luke may have isolated himself into the old jaded Jedi hermit shown in the movie. Even after 8 months, there are still some pretty major questions that Star Wars fans are seeking about the film. Maybe J.J. Abrams will shed some more light on the mystery of Luke in Star Wars 9. In The Last Jedi, we see Luke Skywalker contemplating killing his nephew, Ben Solo, after he senses that he has turned to the Dark Side. Understandably angry, Solo later comes back to the Jedi training temple as Kylo Ren, destroying everything around it and killing off the young Jedi trainees in the process. Luke's failure to train a new generation of Jedi had a profound effect on him, along with the guilt of trying to kill his nephew. For some Star Wars fans and Mark Hamill, this was not enough to send Luke over the edge and abandon his friends and family in their time of need. Rian Johnson provided a new look at Luke Skywalker that had never been shown on the big screen before, taking a huge risk, which has only seen major backlash as a result. Luke ends up making the ultimate sacrifice in the end to save the Resistance, bringing his story full circle. However, a certain faction of fans, along with Mark Hamill, still don't understand the reasoning behind Johnson's decisions making process. We'll just have to wait and see how J.J. Abrams decides to use Luke in Star Wars 9 upon its release in December of 2019. You can read the fan question and answer below, provided by Mark Hamill's Twitter account. Disney apparently made Hamill delete the tweet, but like all thinks on the Internet it has been preserved. Writer for Movieweb since 2017. Enjoys playing Catan when not writing about superheroes and Star Wars. Will The Rise of Skywalker Characters Ever Return in Future Star Wars Movies?